Each year that the iPhone has been around more and more holiday-themed apps hav e emerged, especially during the Halloween / Thanksgiving / Christmas portion of the year. There are now just tons of these titles around – and now the App Store has got a Featured section devoted to them: the new Holiday Apps and Games section. 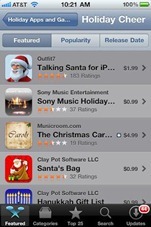 You should see it on the Featured tab on your iDevices and in the Featured section within iTunes. It is broken up into three sub-sections covering holiday apps, holiday games, and holiday cheer. During the next few weeks we’ll be sharing some of the individual holiday apps that we like, as well as some of our general favorite picks – but if you’re after a broad selection of what’s out there, this new App Store section should be a good starting point. What criteria determines which holiday oriented apps are featured in the holiday sections?